People are always looking for the right topping to make a plain salad look and taste more exciting. They fill their bowls with crispy croutons, candied nuts and piles of parmesan cheese so that their leafy greens aren’t so dull. If you believe that eating salad sometimes feels more like a chore than a meal, you should top your greens with cooked lobster — this fresh seafood ingredient will make sure that your next bowl of salad is anything but boring. Before you start buying heads of lettuce, you should find a way to get the best lobster for your salad — purchasing fresh seafood is just as important as picking vegetables that are clean and ready to eat. If you don’t live near a fish market, there is no reason to worry — you can get lobster delivered to your door with the help of online shopping. You can order fresh Maine lobster and then have it shipped directly to your home in twenty-four hours. If you use the website Lobster Anywhere, you can have your seafood delivered to any location in the United States of America, including Hawaii and Alaska. Once you have your hands on this spectacular ingredient, you can cook the meat and put it in one of these delicious salads. A traditional version of this dish involves pieces of grilled chicken, bacon bits,cooked corn, slices of hard-boiled egg, avocado, tomato and chopped salad greens, typically iceberg or romaine lettuce. 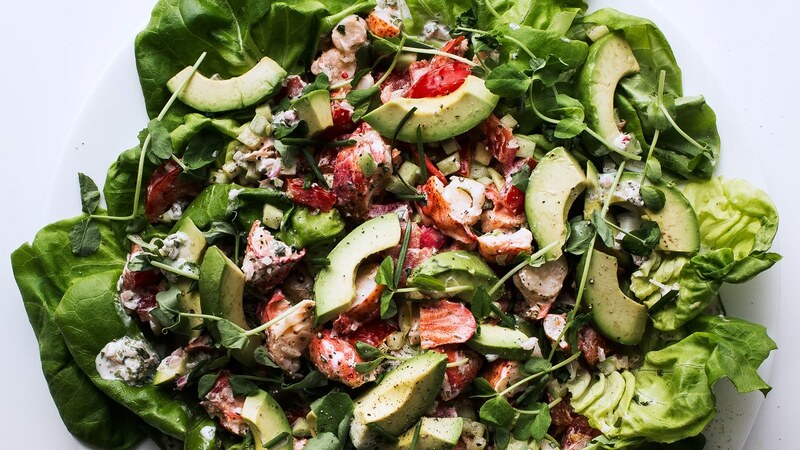 For a tasty seafood twist, you can make a lobster cobb salad and forego the portion of chicken — the steamed lobster meat is just as healthy and flavorful as a protein. There are several ways that you can toss together a beautiful salad starring citrus and cooked lobster meat. You can add thin slices of grapefruit, blood orange or navel orange, or segments of sweet clementine into a bowl of mixed greens. Throw in vegetables like endives, green beans or pea shoots, and then sprinkle on the pieces of lobster meat. You could also make a lobster salad with a citrus vinaigrette, using the juice and zest from oranges and lemons to make a sharp and tangy dressing. In this particular case, you won’t be using a ramekin of clarified butter to go with your lobster, you will be using leaves of butter lettuce. A light and acidic dressing is a recommended pairing for your butter lettuce and lobster salad so that you aren’t overwhelmed by the rich ingredients — mixing tarragon, olive oil, white wine vinegar, Dijon mustard, salt and pepper will make for a delightful homemade recipe. If you really want to feel extravagant, replace your white wine vinegar with tablespoons of Champagne or any other sparkling white wine that you have on hand. Lobster meat is a great option for wholesome meals because it is high in protein, low in fat, full of minerals and vitamin B-12. When you put this ingredient in your salad or use it as your protein substitute, you will make your healthy dish even healthier. « How Many Types of Italian Pasta Can There Really Be?